Wet weather and (very) tricky conditions today for the first free practice sessions ahead of the 6 Hours of Fuji on Sunday. After a rather uneventful first session, the second practice was shortened due to a 50 minute red flag when Vitaly Petrov had a rather big off in his Manor Oreca, requiring repair works to the barriers. Porsche had the best start of the day with both 919 Hybrids on top of the timetable after the fiirst 90 minute practice session. André Lotterer went fastest in the #1 Porsche in a 1.35.527, beating Earl Bamber in the #2 sister car with 0.133 seconds. 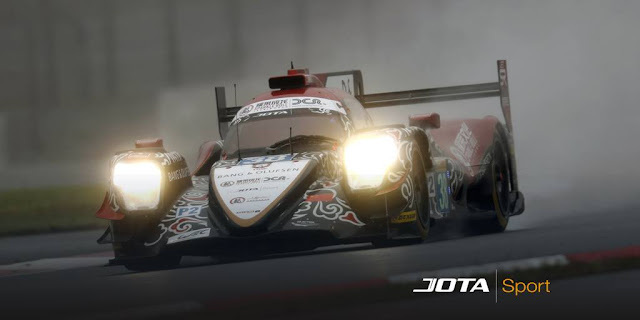 Jose Maria Lopez was the fastest Toyota driver, putting the #7 TS050 on third place, just under half a second behind Lotterer. Sébastian Buemi was fourth fastest in the #8 Toyota. 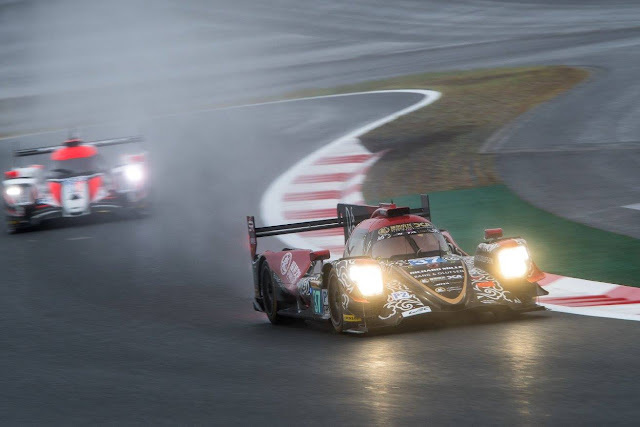 In LMP2 Alex Brundle got around fastest in his #37 Jackie Chan DC Racing Oreca 05 in a 1.42.735. Matthieu Vaxiviere in the #28 TDS Racing was a stong second fastest, 0.490 seconds behind Brundle. The #38 Jackie Chan DC Racing was third fastest in the hands of Ho-Pin Tung, with Ben Hanley in the #24 CEFC Manor TRS Racing behind him. Gustavo Menezes in the #36 Signatech Alpine completed the top 5, 0.992 seconds behind Brundle. Porsche not only dominated in LMP1, the GTE Pro class was also the German's territory with both 911's quickest in the morning session. Michael Christensen clocked a 1.47.365 in the #92, giving him an advantage of 0.252 seconds ahead of Richard Lietz in the #91 sister car. Both AF Corse Ferrari's followed the Porsches, Davide Rigon third fastest in the #71 (1.47.627), Alessandro Pier Guidi fourth in the #51 488 GTE. Ford took fifth and sixth place, the Aston Martins struggled for pace in the bad conditions, giving in over 5 seconds compared to the top runners. 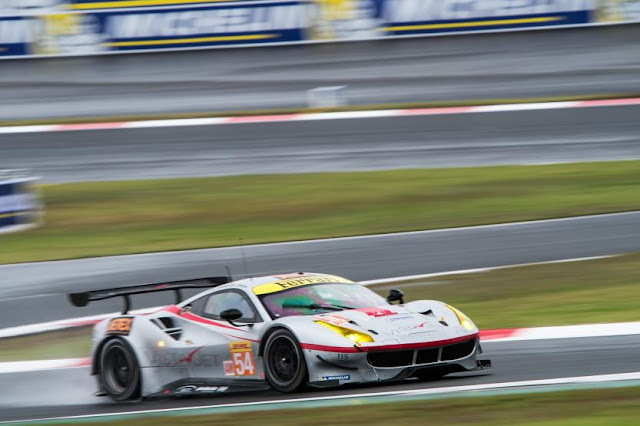 Ferrari was on top of the GTE-Am class, Miguel Molina fastest in 1.47.655 in the #54 Spirit of Race, 0.591 seconds ahead of Matt Griffin in the #61 Clearwater Ferrari. The pink #77 Dempsey-Proton Porsche came in third fastest with Matteo Cairoli behind the wheel. 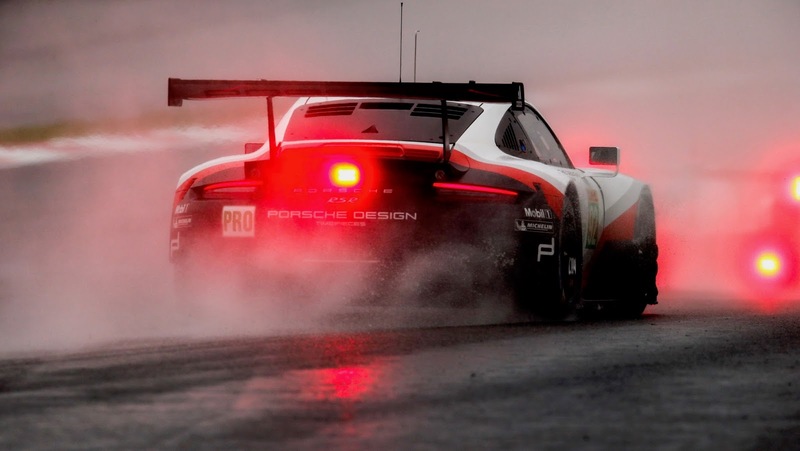 The second session was even wetter than the first session with heavy rain falling down on the track. 15 minutes into the session, Vitaly Petrov went hard into the barriers at the 100R corner, causing the session to be red flagged for about 50 minutes due to repairs to the barries. FP2 turned into a shortened session in which the fastest times were set early on before the red flag and only 30 drivers set a time. 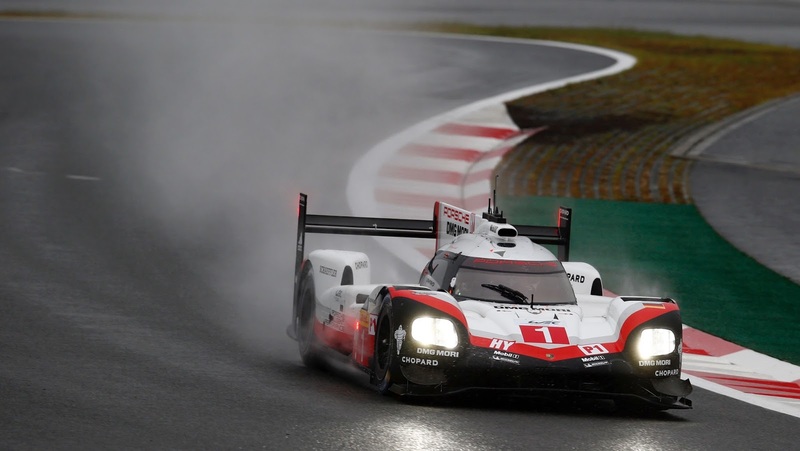 José Maria Lopez was fastest in his #7 Toyota TS050 Hybrid in 1.39.202, over 1.3 seconds ahead of Neel Jani in the #1 Porsche. 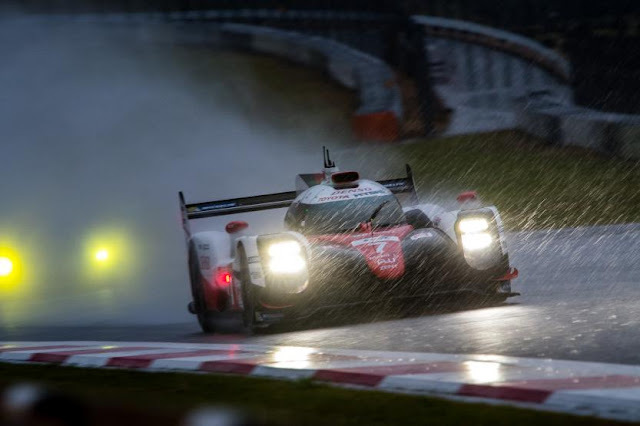 Kazuki Nakajima went third fastest in the #8 Toyota, with Timo Bernhard behind him in the #2 Porsche. Jackie Chan DC Racing was quikest again, but now it was Thomas Laurent in the #38 who set the fastest time. His 1.47.437 was 0.084 seconds faster than Bruno Senna in the #31 Vaillante Rebellion. Despite his crash, Vitaly Petrov still clocked the third fastest time in the session with 1.48.004. Rounding out the top 5 were Roman Rusinov in the #26 G-Drive and Mathias Beche in the second Vaillante Rebellion (#13). 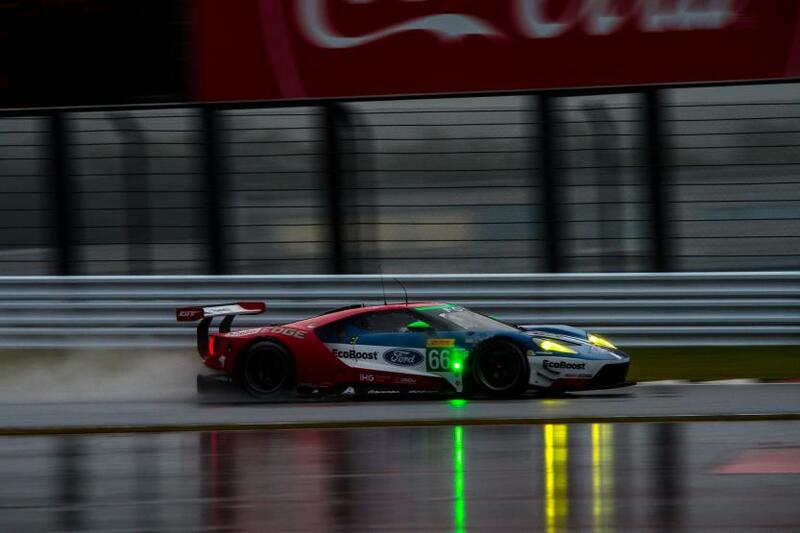 Olivier Pla took the top spot in GTE Pro in his #66 Ford GT with a laptime of 1.52.658, holding off both Porsches. Fréd Makowiecki followed close in the #91 Porsche, just 0.052 seconds behind his fellow Frenchman. Kevin Estre was right on the heels of his teammate, 0.009 seconds slower in third place. 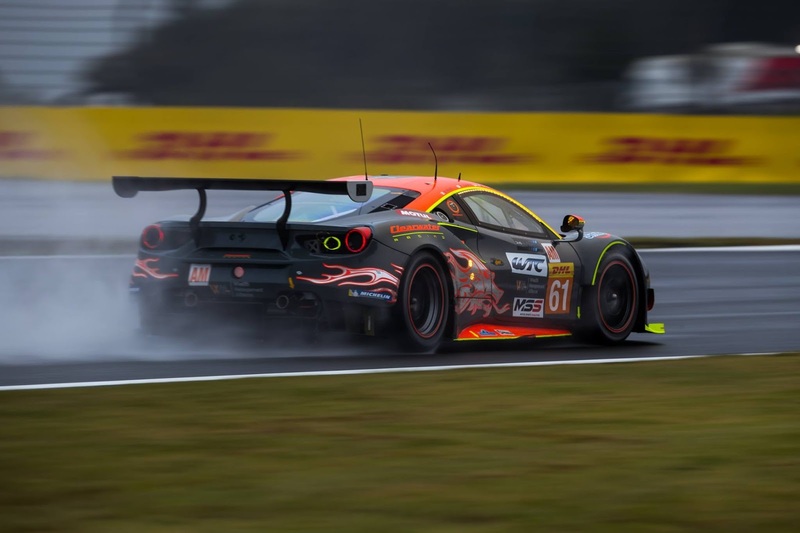 The first Ferrari was the #51 AF Corse of James Calado in fifth place, both Aston Martins closed the GTE Pro classification this afternoon. In GTE-Am the Clearwater Ferrari of Keita Sawa now was fastest in 1.53.381, even quicker than both AF Corse Pro Ferrari's. Francesco Castellacci in the #54 Spirit of Race Ferrari came in second fastest with Ben Barker behind him in the #86 Gulf Racing UK Porsche.